Take Back Your Smile With Natural Tooth Replacement! It doesn’t matter if you are missing one tooth or an entire arch of teeth, replacing them is crucial to your long-term oral health. 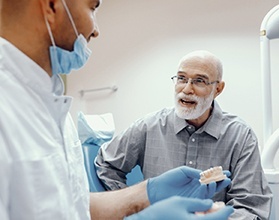 For years, the only options to replace teeth were traditional dentures and bridges, which don’t even go far enough to prevent the negative consequences of tooth loss. Now that you can get dental implants from Chevy Chase dentist Dr. Ronan Freyne, that’s all about to change. Contact our office today to schedule your dental implant consultation! Unlike traditional tooth replacement methods, dental implants are designed to integrate with your existing jawbone. This process is known as osseointegration and takes place over the course of several months. Once fully integrated, your replacement should feel almost identical to your previous tooth. With a fully integrated dental implant, your jaw will maintain its regular shape thanks to the implant consistently stimulating the bone inside your jaw. Chewing your favorite foods also feels completely natural, whether it be your favorite cut of steak or an apple. Blood flow is also restored, allowing you to maintain your youthful appearance and your cheeks’ natural elasticity. Finally, dental implants are designed to withstand the test of time. On average, implants last anywhere between 25 years and a lifetime when properly maintained. Clinical studies show dental implants to have a 95 to 98 percent success rate, even after 10 years of use! Dental implants are one of the most versatile tooth replacement options out there. It doesn’t matter if you’re replacing one tooth or several, they can be designed with your needs in mind. To replace a single tooth, a titanium implant post will be placed inside your jaw. This is followed by an all-porcelain crown, which is meant to reflect light exactly like natural tooth enamel. Replacing multiple consecutive teeth is done via an implant-retained bridge. Unlike traditional bridges, which use modified teeth adjacent to the gap to anchor a restoration, implant-retained bridges use an implant on either side of the bridge. Keep in mind that you do not need a dedicated implant for each tooth you intend to replace. Whether you need to replace your top or bottom denture, dental implants are the perfect solution. It doesn’t matter if you need a partial or full denture, both can be custom-made to fit on top of dental implants. You can also opt to have the denture fixed or removable, depending on your preference. The total cost of your treatment will likely differ from another patient’s simply because of how customizable dental implants can be. For one, our office doesn’t know if you need to have periodontal therapy performed since healthy gum tissue is necessary prior to surgery. If you have low bone volume, a bone graft may be needed to make you eligible for implants. 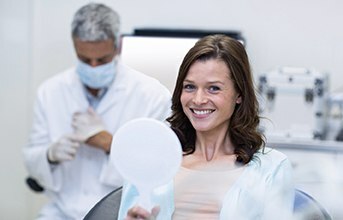 The number of implants you need placed and the type of restoration used will also influence cost. 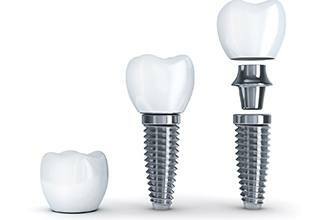 While the cost of dental implants may seem high at first, it should be noted that they are meant to be a long-term investment. They do not require the same level of maintenance nor replacement as other solutions, making them the most cost-effective solution out there. When you have a tooth that’s meant to last for decades, you have the peace of mind that your new smile will stay intact.